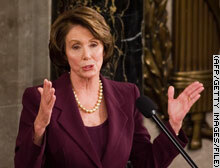 WASHINGTON (CNN) -- Nancy Pelosi, the new House speaker, cautioned President Bush Sunday that if he calls for additional U.S. troops to be sent to Iraq, he will have to show the Democratic-controlled Congress why even more money should be poured into the war. The top Republican in the Senate, Mitch McConnell, said he believes Bush will ultimately get the funding. Speaking on CBS' "Face the Nation" Sunday, Pelosi said, "The American people and the Congress support" the troops currently in Iraq. "We will not abandon them," she said. "But if the president wants to add to this mission, he is going to have to justify it. And this is new for him because up until now the Republican Congress has given him a blank check with no oversight, no standards, no conditions." It was the next step in a message she laid out Friday in Baltimore. "The president now knows that he does not have a blank check from Congress without any justification," she said then. "He also knows that we will do what we must do to support our troops. Democrats have removed all doubt about that." Disputes over whether more troops would help improve conditions in Iraq -- where raging violence is claiming thousands of lives each month, according to the United Nations -- do not fall strictly along party lines. But overall, Democrats have been much more skeptical, and they won the 2006 midterm elections largely based on their calls for "a new direction" in Iraq. Senate Minority Leader McConnell, R-Kentucky, said Sunday that he would back funding for additional troops. "If the president recommends what we seem to believe he's going to recommend, I intend to support him," he told "Fox News Sunday." Asked whether his GOP colleagues would support the call, he responded, "I think there will be some who will and some who won't." But, he added, "even though this will be a controversial step, I think the president will be able to carry it out, and I hope he'll be successful." House Speaker Nancy Pelosi, D-California, speaks at opening day ceremonies for the 110th Congress on Thursday.